This last year of ministry has been a season of deep personal reflection, spiritual insight, and a time of growing in mutual accountability with my brothers in the Lord. Over the last several months, I have been in a process of intentionally discipling a number of younger fellas in the ways and responsibilities of true biblical manhood. In addition to this personal effort to reinforce the masculine values of virtues found in the Holy Scriptures, the church where I am on staff at has also begun a massive revamping of our men’s ministry. While I focus primarily on discipling college guys, the men’s ministry as a whole has been working to bridge mentoring relationships with sons, fathers, husbands, and our bachelors in the church. 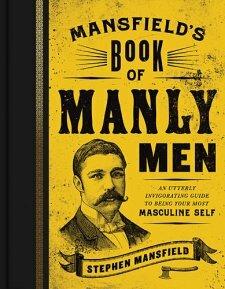 The new book by bestselling author Stephen Mansfield, “Mansfield’s Book of Manly Men: An Utterly Invigorating Guide to Being Your Most Masculine Self”” has given both ministries I am connected with, an invaluable tool for facilitating spiritual growth among the gentlemen in our faith community. Like Mansfield’s other books on Abraham Lincoln, Winston Churchill, Booker T. Washington, and Author Guinness, the author once again relies heavily on the classic insights available throughout character studies in history. In addition to some of those notable men already listed, the men of great standing studied in this new work, include King David, General George Patton, President Harry Truman, and the legendary UCLA basketball coach John Wooden. 1.) Manly Men Do Manly Things. 2.) Manly Men Tend Their Fields. 3.) Manly Men Build Manly Men. 4.) Manly Men Live to the Glory of God. Each point is clearly articulated and unpacked in its own chapter throughout Part 1 of the book. Part II covers the qualities of “Manly Men”. These characteristics are based more on spiritual strength than physical and address topics such as friendship, restoration, self-education, integrity, suffering, humility, and sacrifice among others. Finally, Part III is essentially a treasure trove of resources including fifty quotes for Manly Men from leaders like Martin Luther King Jr., theologian and writer C.S. Lewis, and revolutionary forefather, Patrick Henry. In addition, Mansfield offers “The Ten Essential Books for Manly Men” which included a couple of my personal favorites, “Halftime: Moving from Success to Significance” by Bob Buford and “Every Man’s Battle: Winning the War on Sexual Temptation One Victory at a Time” by Steve Arterburn. As for cinema pictures, the movies “It’s a Wonderful Life” and “Chariots of Fire”, are suggested as must watch films. All in all, “Mansfield’s Book of Manly Men” is just that- a book for men that illustrates the necessary traits required by God of men. Ideals like compassion, conviction, and consistence are promoted with the perfect life of Christ set as the back drop of the book’s focus. Manly Men do not abuse or disrespect women but instead protect and defend their counterparts. They do what is right without compromise and in full acceptance of the consequences. And most critical of all, Manly Men honor God with their lives and understand that the point of existence is not for selfish gain, but instead to be emptied out for the benefit of others. [Guest Post] The Buck Stops Where? This sounds like a great book. Thank you for reading and reviewing it.